“Identities in transitional societies” is a special issue in the Journal of Psychology in Africa published in May 2017. The aim of this special issue is to present and debate the manifestation of the multiple dimensions of identity as they evolve in transitional societies. The special issue presents the perspectives of a variety of scholars from across the world-all focussed on and actively involved in finding answers related to the interesting, complex, and dynamic process of making meaning of identities. Research in this issue emanated from a small rural community in the Eastern Cape (South Africa), through Africa (e.g. Malawi), into Europe (both the Netherlands and various Central Eastern European countries), and to the United States of America (USA). The issue commences with two conceptual papers that provide a framework for the articles that comprise this issue. These two positional papers are followed by ten original research articles and two brief reports; each with innovative context-sensitive applications. Together, these contributions provide a glance into the varied nature of identity in transitional societies. This is further examined in Luzelle Naudé’s Editorial. 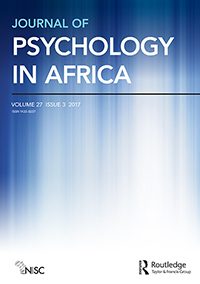 Read more about the Journal of Psychology in Africa here.